Working families deserve a Supreme Court justice who will respect the rights of working people and who will enforce decades of legal precedent that protect us in the workplace. On Monday night, President Donald Trump rejected working men and women by selecting Judge Brett Kavanaugh to fill the vacancy created by Justice Anthony Kennedy’s retirement. Working people expect the Supreme Court to be the fairest and most independent branch of government in America. 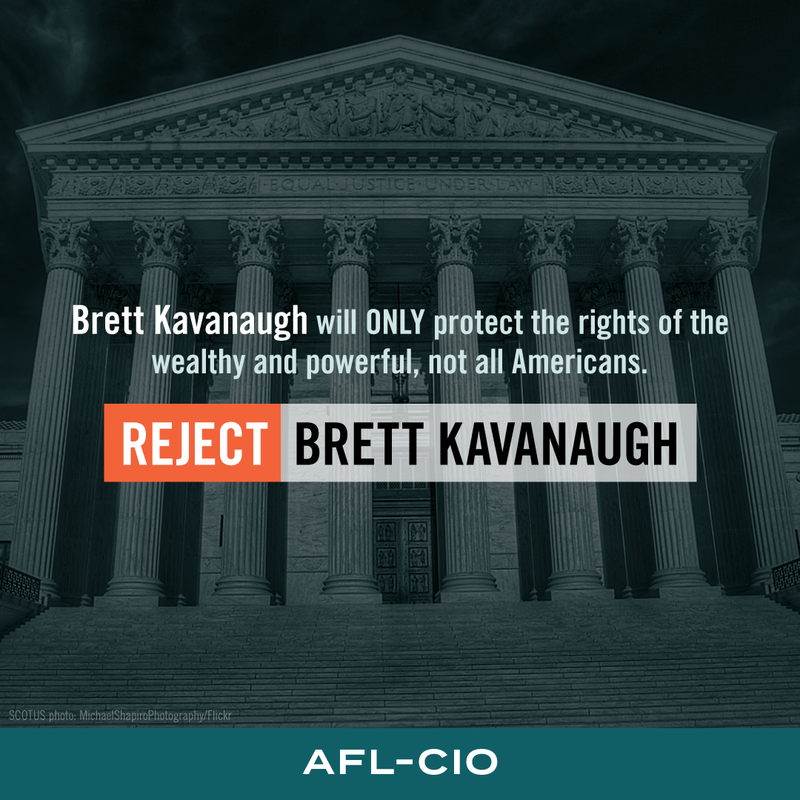 Any senator who believes Supreme Court justices should protect the rights of all Americans should reject this nomination and demand a nominee who will protect the rights of working people and uphold our constitutional values of liberty, equality and justice for all. Across the country, working people are organizing and taking collective action as we haven’t seen in years, and we won’t stand for any politician who supports justices who put our rights at risk. In American Federation of Government Employees, AFL-CIO v. Gates, a partial dissent argued that Kavanaugh’s majority opinion would allow the secretary of defense to abolish collective bargaining at the Department of Defense. In Agri Processor Co. Inc. v. National Labor Relations Board, he argued that a company didn’t have to bargain with an employee union because the employees were ineligible to vote in the union’s election because they were undocumented immigrants. In SeaWorld of Florida LLC v. Perez, he argued that a safety citation issued against SeaWorld after a killer whale killed a trainer was too paternalistic. In Venetian Casino Resort LLC v. NLRB, he sided with a casino after an NLRB decision that the hotel engaged in unfair labor practices by requesting that police officers issue criminal citations against legal protesters. In Miller v. Clinton, he argued that the U.S. State Department could fire an employee because he turned 65. In Howard v. Office of the Chief Administrative Officer, he argued that a black woman couldn’t pursue a race discrimination suit after being fired as the deputy budget director at the U.S. House of Representatives, claiming that the firing was protected under the Speech or Debate Clause of the Constitution. In Seven-Sky v. Holder, he argued in a dissent that a president could declare the Affordable Care Act unconstitutional and not enforce it, despite it being passed by Congress. He appears eager to overturn the well-established U.S. Supreme Court precedent of Chevron USA Inc. v. Natural Resources Defense Council Inc., which held that unelected judges must defer to executive agencies’ construction of a statute when Congress has given an agency primary responsibility for interpreting its mandates, so long as the agency does not act contrary to Congress’ clear intent. He wrote two dissents contending that a large corporation, in these cases Exxon Mobil Corp., should not be held responsible for its overseas misconduct. After Indonesian villagers alleged they were tortured and killed by soldiers working for Exxon, Kavanaugh argued that allowing the villagers to sue Exxon would interfere with the U.S. government’s ability to conduct foreign relations.